Search-form presets - search for available 'economy' and 'compact' cars at the rental location 'Vicenza - Downtown Center'. Address: Via Monte Zovetto, 43, Vicenza Vi, 36100, Veneto, Italy. You can also select any of the 2 available rental locations in Vicenza using the white search form, or change the class of the desired low-cost vehicle to 'Mini' or 'Compact'. The most popular models representing the mini, compact, and economy car segments in Vicenza are: Citroen C3, Toyota Corolla, Toyota Auris, Opel Astra, VW Golf, Ford Focus and others. At the rental office in Vicenza, consider to take a 'Breakdown Assistance' package or ask an officer for a contact data to use in case of a vehicle breakdown. Cheap cars are sometimes unpredictable in operation. 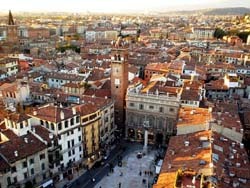 OrangeSmile.com wishes you a safe and great trip to Vicenza! If a hotel, in which foreign tourists stay, is located in the abovementioned zone, then entering the area is free. The hotel staff should be informed about the car in advance, so they can report the plate number to the police and add it to the list at the checkpoint. Vicenza is famous for its grandiose architectural monuments, the most famous among which is the Basilica. 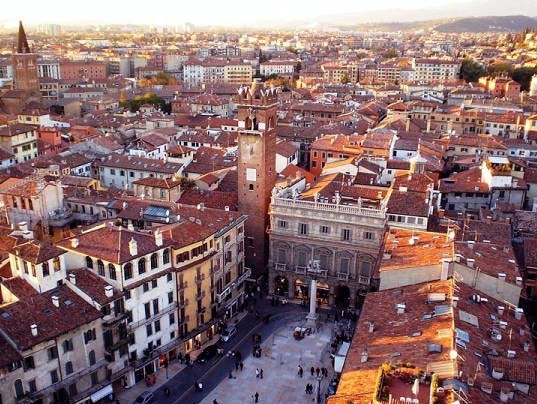 It is the first building in the city constructed under the guidance of the famous architect Andrea Palladio. The beautiful church was built on the site of the old town hall. Its construction began in 1549 and was completed only 30 years after the death of Andrea Palladio. Locals believe that if you visit Basilica Palladiana with good thoughts and ask God about something, all wishes will surely come true. Early in the morning at the church you can always see people who come to worship the sacred relics. A landmark of world importance is the Palazzo Chiericati building rising on one of the hills. Modern architects do not cease to admire the beautiful villa, which was also designed by the aforementioned architect. The villa was built in 1571 by order of Count Girolamo Chiericati who loved to stay in Vicenza. The world-famous local attraction is the Teatro Olimpico resembling a prehistoric arena by its shape. The construction of the grand theater is connected with quite an unusual story. The project plan of the cultural institution presented by Andrea Palladio was so ambitious that the theater academy simply could not afford to implement it. Nevertheless, people of theater did not want to give up the original idea of building an antique theater and asked local patrons for financial support. In return, they offered to place sculptural portraits of patrons on the stage. These monuments can be seen in the theater even today.